Yesterday was February 1st, for me that was like my January 1st in terms of a New Year’s fitness resolution. I really did intend to be more active and planned to log in several miles on bikes, kayaks and long walks when we were in Key West. The weather did not cooperate with my good intentions. I am guilty and the first to admit, that the first thing I turn to for comfort, is food in any form. Mostly snacks, and sweets, but no limits on quantity. Combined with very little activity and no self control, somehow once again, my pants have shrunk. Finishing off month One with week long birthday celebrations and I finally reached a point where enough is enough. It’s time to get serious. Beach days are coming soon, and I am in no way physically ready for them. Mentally, yes…I’m ready to squish my toes into the sand and today. I finally calibrated and synced my new Garmin Vivofit fitness tracker and dug out my workout clothes from the bottom of my drawers. Last year, they were always on the top, because I practically lived in them. Sean is ready for a new fitness commitment too. So we laced up our sneakers together and hit the beach for day one of getting physical fitness started in 2016. There was a light breeze blowing in from the sea that brought with it salt air to greet me with a kiss, quickly reminding me just one of the reasons we moved here. 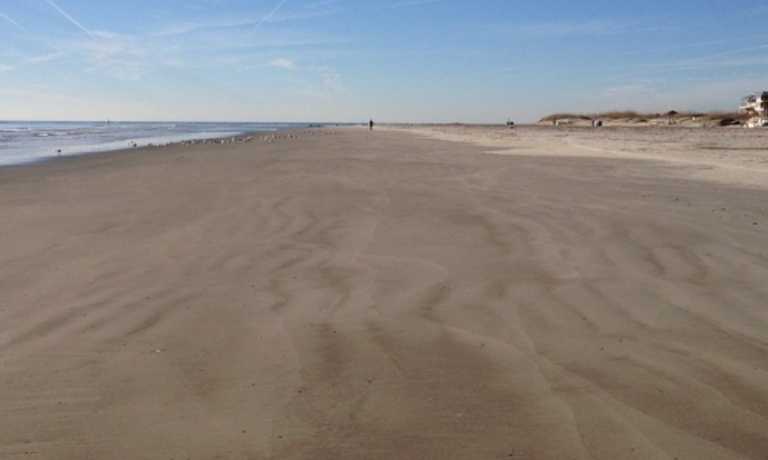 Walking on the beach provides a different workout than walking on the sidewalk. For a while we chose the soft uneven sand for a little more strenuous hike. We said to each other how walking in the deep soft sand in shoes instead of bare feet felt as close to walking in inches of snow as we want to feel. After a while I had to stop and dump the mounting sand out of my shoes. Snapshots quickly flash to the front of my brain. 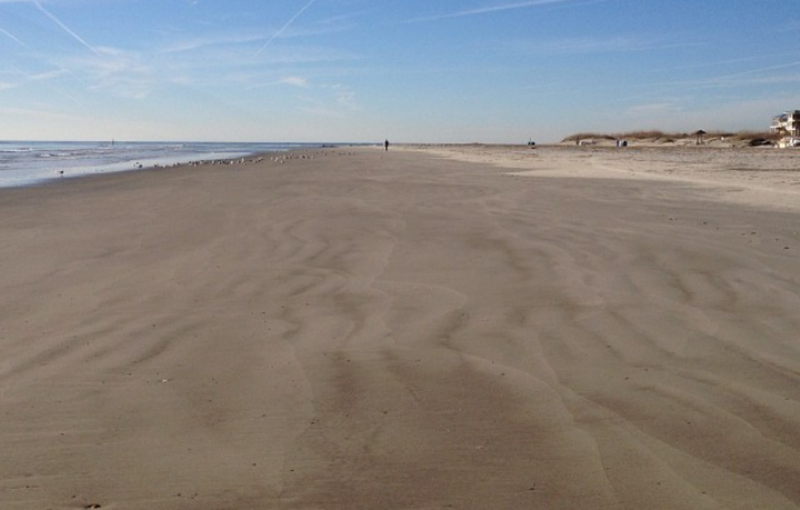 Only months ago this same beach was packed with thousands of tourists. Moms and dads that plan and save every penny all year long to claim a little square patch of oceanfront property for a week. Today the beach was not totally empty, as a few families were out beachcombing. Passing an occasional fully clothed child, running in circles or building a sand castle. Definitely a far cry from the crowd’s that gather during the summer. It’s a shame more people don’t take advantage of the great deals that are available during the winter season. We passed a surfer, covered head to toe in a black wet suit. He owned every wave that came to him. For the next mile, we traveled just below the high tide line where the packed sand beneath our soles provided a more stable surface to walk on. We walked under the pier and down to the south end where the Back River flows into the Atlantic Ocean. We stayed on the sand as far as we could, till we reached Alley Three. This is where we come to watch the sunset on countless evenings throughout the year. The beach stops at Alley Three and we turn right onto the hard blacktop pavement. Continuing around Chatham Avenue that hugs the Back River till we reach the marsh. Every few steps, the tall palms reaching to the clouds frame a picturesque scene. The silent shutter in my head snaps away and my imagination paints canvases with the details of a snow white egret flying low over the brown winter marsh grass. Soon we are back in the little strip of the Back River neighborhood with rows of cottages and beach houses on either side of us. We stop and talk to Bill, who is walking his dog. We enjoy talking to Bill and his wife Dorothy, every year as they come to Tybee, annual snowbirds escaping the brutal Michigan winters. They are smart people, just saying. Before ending our walk we go a few blocks north so we can stop at the IGA to gather salad fixins for a healthy lunch. Entering the parking lot from the back of the store, we run into Matt, the butcher. Matt always has a smile on his face and a kind word to welcome us. After paying for my selection of fresh veggies, we headed back to 14th street, our little piece of paradise. A car pulls up beside us. It’s my friend Diane, who owns a vacation rental company here, called Mermaid Cottages. (If you plan to visit Tybee, you really need to check out these adorable family and pet friendly cottages.) She rolled down her window to tell me that Sean and I looked like a picture of ultimate Tybee living. Walking with the love of my life in one hand and a sack of groceries in the other. The sun continued to shine down on a most glorious day. We made our last turn to complete our circuit, looking at my tracker I see that we reached 3 miles. Not too bad for day one. I GA for breakfast fixins’. Just another day in Paradise! Any places for sale down there??? So glad you’re happy, Wen! I love the way you write – keep writing!! There sure are some for sale!! Thank you for reading and always encouraging!! Love you and your family!! Sadly a month has past and we haven’t been on the beach even once. We have walked the island, but because we walk an old dog (Lady just turned 12) we can’t go on the beach. She is getting weak back legs and exercise is so important to keep her mobile, so we usually don’t walk without her. We went to Fort Pulaski on Sunday and walked Lighthouse Trail. She is welcome at National Parks. After reading your blog we know we must get to the beach. BTW – we missed you by minutes at Huck A Poos’ on your birthday. I hope you are enjoying the sunny weather this week! Sure beats Michigan this time of year!